This film about a man at the top of his career who is just fed up with his life’s aspects is a one of a kind treat that uses animation for adults. 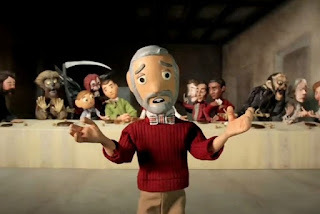 The engaging use of stop-motion blended perfectly with the story. The set pieces were incredibly detailed and looked as if they were real airports and hotels. When the film opens, the audience sees a light brown sky with an airplane right in the middle of velvet clouds. I was so interested on how they did that as it looked very realistic. Throughout the whole experience I was thinking about how much time it took the team behind this project to complete it. One part of the creative process that I found very likable was the line in the middle of the puppets’ faces. This reminded us that they were just figures that needed to be moved all of the time. Then with that you realize how well of a performance the filmmakers did in achieving completion. The water that we saw on the pavement in the airport pick-up area looked so cared for that it was a little eerie. In regards to the story, there is an early scene when the focused on character, Michael Stone, checks into his hotel. The clerk looks at him the whole time while he is typing to get a special room for him. This tiny segment was pretty laughable when we see Michael Stone’s tired face looking back at the clerk. Another way the filmmakers put everyday situations in the movie was when the bellhop asks for money without saying anything. These puppets were the perfect use for comedy. Michael Stone seems like he’s tired of his life and the routine of people catering to him all of the time. He doesn’t like where his mind is at because it seems bleak and sort of depressed. He has a son and an on the rocks relationship with his wife. He is a customer service guru with a book that has just come out. He’s sad and angry at the same time. I could fully understand all of the character’s emotions through this puppet thanks to some wonderful acting from the voice for Mr. Stone. A relationship occurs through one night in the film and there are some huge factors of loneliness that are turned to love which was beautiful to me. I was very impressed because now I know about one more action that animation can bring to us.